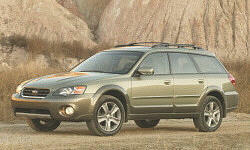 Subaru Outback Interior Styling Pros and Cons | Page 1 of 1 | Why Not This Car? The interior color combination on the Limited with leather is beautiful with a nice balance of tan/black/fake wood accents. Downside is the light color on the tan color really shows marks. More signs of dirt after 3 months than a Honda we had for 3 years. Silver paint on large portion of dashboard can create glare on bright days.Screen equipped models have poor resolution not commensurate with pricing of this vehicle.Dash board design already looks dated. Needs to be old school or modern, not in-between. Light biege trim and large glass sunroof make for a very light, airy feeling. It feels larger than it is. Good, well-wearing leather(-ette) trim. Metal-like console trim could be better, though. Dashboard materials. Brushed "Aluminum" plastic plus faux "wood" accents are lame. Lack of straight surfaces make mounting a GPS or Sirius radio a challenge. Leather seats are not as comfortable as expected for long drives. Cargo area a bit cramped. The interior is simple, without a lot of gadgety distractions, and the seats are firm and the material seems durable. For the price. The interior was vary bland. Very plain looking. Not a lot of features and techie things incorporated into the design.